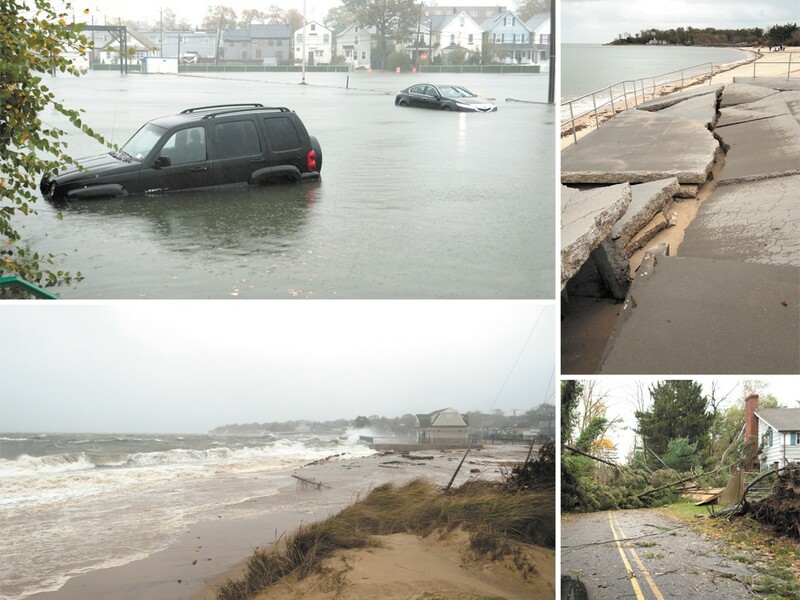 Hundreds of miles wide, Hurricane Sandy killed at least 113 people along the East Coast. My hometown on the New Jersey shore is called Manahawkin, which in the language of the Lenni Lenape Indians supposedly means “fertile land sloping into the water.” And we do: You can take a boat from the lagoon in our back yard out to a bay, around an 18-mile sliver of land known as Long Beach Island and out to the Atlantic Ocean. But only once in 33 years had that ocean ever pushed enough water around to threaten our home. That time, when I was in seventh grade, it gently lapped against our concrete foundation and left with the lowering tide. So despite the media hype, it wasn’t till the night before Hurricane Sandy hit that my nerves began to jangle. It started with a photo, texted by a friend as I lay drifting to sleep, of a restaurant on Long Beach Island called the Chicken or the Egg, or the Chegg. It was a place my friends and I used to bring six packs of beer and gorge on chicken wings before strolling up to the ocean a few blocks away. The hurricane was 20 hours from landfall and in the photo at least a foot of water surrounded the Chegg. By the next afternoon, rescue personnel were driving small aluminum boats through flooded roads of another Long Beach Island town searching for people too foolish to evacuate. Each hour before landfall brought more photos: 12-foot waves down by Cape May. Joey Harrison’s Surf Club, a local venue, battered by sea spray. Before I quit our downtown Spokane office that night, I found one more photo, of a joint named Joey’s Pizza. About four miles as the crow flies from my home, Joey’s swam in at least six feet of water. We awoke to a new landscape. All along the shore, blocks of beach houses crumbled into themselves or one another. Many were swept away, leaving blank splotches of sand amid the wreckage. To the south lay Atlantic City — you can see its casinos from the end of our neighborhood across miles of flat bay — fully submerged. To our north, Seaside Heights, battered and ruined. Most know Seaside as the breeding ground of the exploitation show Jersey Shore. To me it was a kid’s wonderland, with open-air arcades, game booths and cheesesteaks, all on a wooden oceanfront boardwalk. Now, the ocean pier roller coaster that sent kids zooming over waves sits collapsed in the ocean. In Holgate, a town at the southern tip of Long Beach Island, Sandy’s 18-foot waves ripped homes from their foundations; crushed cars sit there in four feet of sand that covers the streets. My family members evacuated; no one I know was among the 113 Sandy killed in the states. My aunt, whose home lies not far from that sunken roller coaster, hasn’t yet been allowed back there. Her house stands, but we don’t know if it will survive. Our house took two feet of water. My mom will probably have to live with friends for weeks or a few months. We’ll have to replace our floors and carpet, the bottom four feet of each wall, all the electrical sockets, our washer and dryer, all the furniture. I lost my late father’s gigantic wooden office desk, which I had hoped would someday become my writing desk. My mom is anxious to get the repairs going, and works in the house now during daylight — we won’t have electricity for some time — carting out soggy remnants of our former life. I worry about being so far away, and not being able to help. Sandy is a destruction that will stick to us, a humbling reminder that we humans are still powerless among the larger forces of nature. But other things will stick, too. Like the friends giving my mom a temporary place to live. The high school teacher and students who came by a few days after to help pull soggy carpet and other debris from our house. The thoughts and prayers of neighbors and family, near and far. People are talking about the storm and whether it was brought by global warming. Is it wise to rebuild? Maybe not. Will another storm like this visit? Sure, in 10 years, or 50 years. But we will rebuild. Not because we’re blind to risk. Not because we’re Americans, and that’s what Americans do. We’ll rebuild because we’re human and like mountain climbers and plane jumpers, we’re drawn to those forces of nature larger than ourselves. Just like the Lenni Lenape Indians who arrived thousands of years ago, we of the Jersey Shore are mesmerized by our sandy little toehold gripping the edge of a hypnotic, overwhelming ocean.